Christ the King is situated in the south east corner of Milton Keynes. Local estates close to church are Walnut Tree, Browns Wood, Wavendon Gate, Walton Park, Monkston, Monkston Park are the nearest. However, many of our congregation travel from far and wide right across Milton Keynes as the grid road system provides quick and easy routes. It's possible to motor from any part of Milton Keynes to church in less than 15 minutes. The church is also within very easy reach of the M1 motorway at either J13 or J14, both are about 2 miles away. If you are using a satnav to find us, our postcode is MK7 6HQ. The approach road from the M1 is the A421. Follow this for about 2 miles from the motorway and pass several large warehouses on your right. A large roundabout is approached. Take the second turn onto H9 Groveway, there is a Vauxhall Car Sales Unit on your left, proceed along Groveway. Go straight on at the next roundabout and the church turn is first on the right. Follow signs for A4146 Aylesbury (this is known locally at H6 Childs Way) then turning left onto V11 Tongwell Street at the petrol station. Proceed straight on at Monkston roundabout, and pass the Kingston Shopping Centre on your left. At the top of the hill turn right onto H9 Groveway, the turn to the church is about 200 metres on the right. Continue to the Brinklow Roundabout and turn right onto V11 Tongwell Street A4146. At the next roundabout turn right onto H9 Groveway and in 200 metres turn right into Frithwood Crescent. The church is straight ahead. Take the road around the church and it will bring you to a car park opposite our entrance. At the A5 junction with the A4146 take Brickhill Street (marked for Bedford). Go across the mini roundabout and over the level crossing; there is then a small roundabout. Continue straight on and at the second large roundabout turn right onto Groveway. Second on your left is Frithwood Crescent and you should see the church straight ahead of you. Take the road around the church and it will bring you to a car park opposite our entrance. The church is situated on a sort of 'island' encircled by local roads'. There are some parking bays to the front of the church (but please do not park in the bays in front of the shop next to the church). Across the road is a car park next to the local primary school.There is also easy parking at Kents Hill playing field. 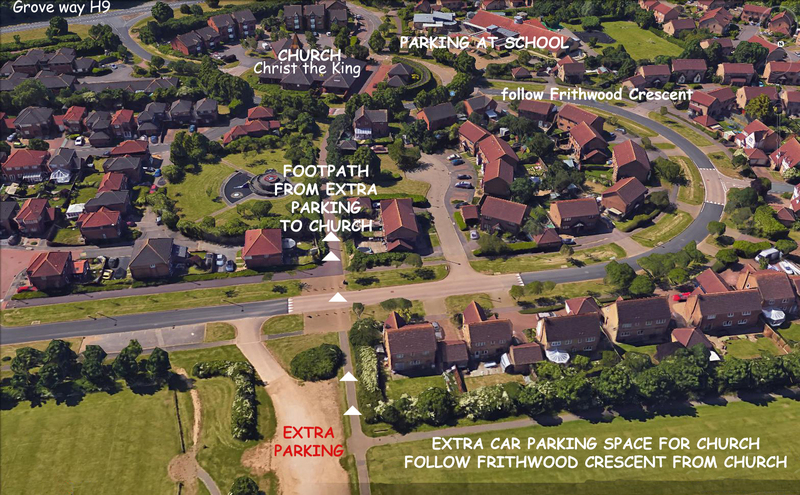 Just follow Frithwood Crescent away from church, the road curves round to the right and the car park is on the left. Walk back to church about 150 metres away by crossing the road and following the redway path downhill (detailed in parking map dowloadable below). There is also a Rapid Charger for electric vehicles outside the shop next to the church. The No 8 bus from Central Milton Keynes to Browns Wood stops nearby at the Walnut Tree Roundabout North stop and on Monday-Saturdays the No 12 from Central Milton Keynes to Caldecotte stops next to the church itself (see downloable map below for bus stop locations). Cycle parking racks are at the front of the church where there is also a Santander Bikes Docking Station.